One of only a small group of physicians who have published over 400 peer reviewed studies, Dr. LaPrade's research is used around the world to improve patient outcomes. “It is a fantastic achievement that Dr. LaPrade has now surpassed 400 peer reviewed publications,” said Dr. Matthew Provencher, orthopedic surgeon at The Steadman Clinic. 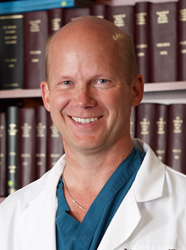 Top knee complex surgeon Robert LaPrade, MD, PhD has now published over 400 peer reviewed studies. To date, there are only a few clinicians, scientists and surgeons who have reached this milestone in orthopedic research. Dr. LaPrade has utilized his comprehensive research on sports medicine injuries to improve patient outcomes and pioneer new ways to treat knee problems. Peer reviewed publications are the highest standard by which quality research is judged because they are scrutinized by peers for accuracy and relevance. Most recently, Dr. LaPrade was selected for the Cabaud Memorial Award at the 2017 American Orthopaedic Society for Sports Medicine Annual Meeting for his work, “Use of Platelet-Rich Plasma Immediately Post-injury to Accelerate Ligament Healing was not Successful in an In Vivo Animal Model.” This award is given annually to the best manuscript submission pertaining to hard or soft tissue biology, in vitro research, laboratory or “bench-type” research, or in vivo animal research. Many of the surgeries that Dr. LaPrade pioneered and invented are now performed worldwide and recognized as the “Gold Standard” for the treatment of many complex knee injuries. In 2014, Dr. LaPrade’s study “Posterior Cruciate Ligament Graft Fixation Angles, Part I and Part II” was the winner of the Excellence in Research Award from the American Orthopaedic Society for Sports Medicine. This led to the acceptance of double bundle PCL reconstructions as the gold standard means to treat PCL tears around the world. Top knee surgeon Dr. LaPrade specializes in the treatment of complex knee injuries and all sports related injuries at The Steadman Clinic in Vail, Colorado. He also serves as the Chief Medical Officer and Co-Director of the Sports Medicine Fellowship Program at the Steadman Philippon Research Institute. Dr. LaPrade has treated athletes at all levels, including Olympic, professional, semi-professional and intercollegiate athletes. He has returned many athletes back to full participation after providing initial treatment of injuries or revising previously failed surgeries.